Tell me more about this "Quilt As you go"
Thread: Tell me more about this "Quilt As you go"
How many of you have used this method? and what do you think? Getting ready to get started making my very first quilt and trying to decide what will work best for me. Since I do not have a long arm machine and I'm not really wanting to send it off to get quilted.. was thinking about this method! I searched "quilt as you go" and nothing came up (but I know a lot has been said about it, just can not find it that way"! Try the Fun and Done method. Go to Bayside Quilting, click on videos, and check out the fun and done method. I made a baby quilt using this method and it turned out lovely. Since I wanted a different size block than the size that they sell for their batting buddy, I went to the dollar store and bought some of their flexible cutting boards and made my own templates. I like the method and I will be adapting it to make more quilts. I am making my first quilt using QAYG because it is a queen sized quilt and I don't have a long arm either. I don't want to pay to send it off either. I am making a log cabin quilt with 9.5 inch blocks. I made the blocks, then cut the batting the same size as the block, and the backing 10.5 inches square. I glue basted the sandwich together and stitched in the ditch for each square to quilt it together. I am using the method shown here (click on "here") almost exactly until the final step of stitching the back closed. I assembled two rows of blocks and realized that you can't SID to close the back seam of each block because if you do, you end up with unfinished section at the conjunction of the 4 blocks. I ripped out all the finishing SID last night and hand stitched them. It looks so much better. I'm really enjoying the QAYG because it is easier to manage one block as opposed to an entire quilt to muscle around. I also like being able to use different backings for each square - it makes the quilt look double sided. See this post about the problems I had with the closing SID. Thank you Thank you Ranchwife for you post. That is exactly how I wanted to do mine but could not find the right video!!! You're welcome. PM me if you have questions and need help on it. Thank you!!! I sure will! Trying to make up my mind on what pattern to do! There are so many beautiful ones for sure!! Check out Leah Day's Snowflake quilt from her site. It was done QAYG and it turned out lovely. Someone did one in pink on QB too. It was beautiful! Posted by Skittl321 under Finished My Shadow Trapunto Quilt. Last edited by Tartan; 04-23-2013 at 07:33 AM. Go to the tutorial section on the board. There are some QAYG quilts there. I did one several years ago. Cross stitched squares I had made it perfect for that method. You will use more batting. I plan to make more. I do quilt queen and larger on my 9" throat DSM with no problems. The more I quilt them, the easier it gets. Most of my quilts are QAYG. However, there are a variety of different QAYG methods. Some are described on this site, but you can also Google "quilt as you go" to find others. I have found a method that works for me, and I am very pleased with the results. It's a fantastic way of doing a quilt. I have made a few. All quilts with section ie blocks can be done this way or use the same method on a quilt by dividing it into sections. Angie quilts blog shows people making quilts this way. Try the Fun and Done method. Go to Bayside Quilting, click on videos, and check out the fun and done method. Can you post a link? I googled for it but had no luck finding the video. Thank you. This is not exactly what you asked and I'll admit I have never tried QAYG, but from one newbie to another, you can quilt with even a small-throated machine. My sewing machine is a bargain-basement Brother that DH found for me on clearance and it has a very small throat. I was incredibly apprehensive about quilting my first quilt on it but it worked out fine. 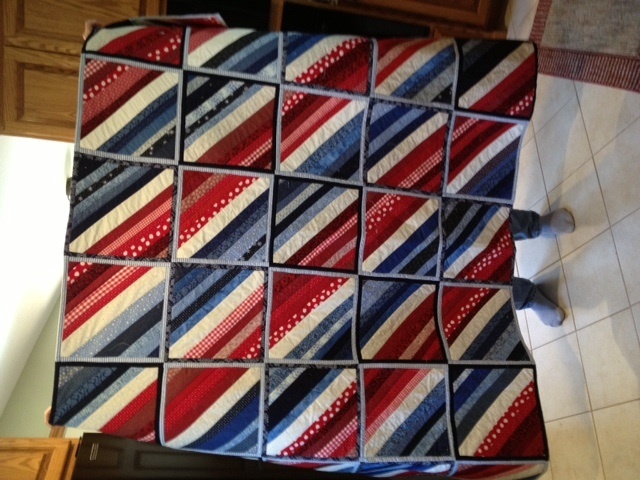 The quilt was 63 in. square. Anyway, I don't in any way want to discourage you from doing QAYG. Just wanted to ease your worry about regular quilting. Have a great time, and can't wait to see your first finish! A few weeks ago I posted a tutorial http://www.quiltingboard.com/tutoria...s-t216993.html about the method I use. Love, love it, but I only do this method for small comfort quilts. Good luck. I think Connecting Threads has a coin quilt that is QAYG. It is done in long strips. One section will belittle strips sewn together and then sewn together with a wider solid strip. It is a free pattern. Nancy Zieman has one similar to it on her blog. I have done the Fun and Done quilts and that is exactly what they are. fun and when you get to the last block DONE, this is the last one I did for our church group project. I loved planning it out and now I want to make one for me! I have made a Fun and Done quilt. Bought the rulers and found that since they are not standard size I can use the smaller one for 7 in blocks. The problem with Fun and Done is the seams to hold the blocks togather can pull apart so use smaller stitches than normal. It makes a stiffer quilt than the normal method. You are seaming as close as you can get when connecting your blocks and the blocks are thick. I wont make another one. You are cutting the backing larger than the block and batting then pulling the backing to the front and sewing them togather to connect the blocks. then you sew the backing to the front of the block. Last edited by Rose Marie; 04-24-2013 at 06:26 AM. If you click on the blog of the person that started this thread, you will see a couple of methods from start to finish without interruption. I've done several with the first method and love both how it looks and how easy the actual quilting is when done on small blocks. Such a sense of accomplishment too. Have fun! Go to Yahoo.com or Google.com and in search block type in quilt as you go methods and may different ones will come up. http://welshquilter.blogspot.com/200...as-you-go.html here is one and there are many more. Any block you like can be made this way and if you have been sewing for a while, not hard to figure out. Let us see what you make. Really like her way of doing it. I've never tried the Fun & Done but I'm thinking of giving it a shot. I have a set of rulers that fit inside each other and go from 2.5" to 10.5" so I could probably do it pretty much any of those sizes. I look forward to visiting all the sites that have been mentioned to see their methods. This was posted the other day on Quilt Board, and I've been wanting to do the QAYG method, and have seen so many different ones. This to me made the best sense, and I just finished making a lap quilt using this method. I like to do samplers and do a lot of BOM's so this to me is the perfect method. Have fun working on yours. Last edited by klgreene; 04-25-2013 at 11:46 AM.